TICKETS ON SALE NOW – CLICK HERE! COME AND BE A PART OF THIS EVENT! 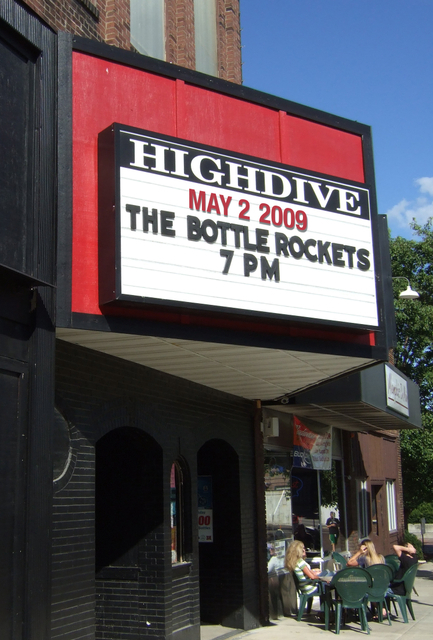 The Bottle Rockets will be playing a special show which will be recorded for an upcoming live DVD release, in Champaign, IL at the High Dive on Saturday, May 2. The DVD will include the show, interviews with the band, and other goodies. Doors open at 7pm. Show starts at 7:30pm. Bottle Rockets all night! (no opening band). The High Dive is one of the best music venues in the country. We are very excited about doing this in such a great place. For travel and hotel info, etc, please visit our message board. Champaign, IL is an easy drive from Chicago, Saint Louis, Indianapolis, etc. There is a full service airport (American Airlines flights connect from Chicago), Amtrak, Greyhound, and Megabus station right across the street from the venue.